Almost every month, Brazil’s newspapers publish reports celebrating a start being made to large new infrastructure projects, writes Patrick Knight. Such projects include laying new stretches of railway, opening up a waterway to traffic, building new highways, or equiping a new, or enlarged port. The politicians who sponsor projects which aim to speed the exports of goods such as soya and maize, iron ore and steel, pulp and petroleum products, as well as imports such as fertilizer, invariably promise jobs for their electors. They also promise that their project will be completed within their term of office, that is to say four or five years. But the same newspapers regularly carry reports lamenting that the work on many of the projects begun a few years previously, has ground to a halt. Funds have run out, the project is not needed so urgently, or another, superior project has been given preference. The need for such projects is explained partly by the fast growth in demand for the commodities produced in Brazil by China, which continues to grow, albeit slightly slower than until now. But as officials at the Association of Oilseed Crushers, ABIOVE, the body responsible for Brazil’s leading export earner, soya beans and meal point out, a method to determine the priority for such projects is badly needed. As things are, numerous often competing projects are begun at the same time. Projects are financed by Brazil’s National Development Bank, the BNDES, so could be controlled. But Brazil’s constitution gives individual politicians the power to initiate such projects, so little is done to curb the waste of resources which occurs. Billions of US dollars are spent on projects, many of which are still incomplete 50 years after they were begun. One example is the notorious 1,500km-long ‘North–South’ railway, which passes through areas where much of the extra soya and maize planted in Brazil in recent years is grown. The North–South line links with the very efficient railway which links Vale’s Carajas mine complex with the fast-growing port of Itaqui, but it is still less than half complete. Many embankments and stretches of track have already collapsed, or are overgrown. Little cargo is carried on this costly route, as even when the track has been laid, sidings and loading facilities are absent, as the money to build them was not budgeted. Five years ago, a set of massive locks was built at a cost of US$3 billion on the Tocantins river, in eastern Amazonia. But because several large rocks just downstream from the lock have not been removed, the lock can only be used for a month or so each year. No buoys have been installed along the Madeira river, which forms the border between Brazil and Bolivia. Thirty years after this river began to be used by barge traffic, vessels cannot move during the night, and no dredging has been done. There is no doubt that large sums need to be spent on Brazil’s creaking infrastructure, as the country has to compete, notably as far as grains and oilseeds are concerned, with the United States, and in normal circumstances, by Argentina. The only exception to the rule is the well-run Vale mining company, whose iron ore has to compete with that from Australia. Australia is much closer than Brazil to China, the main market for ore, so Vale just has to be efficient if it is to survive. Argentina has stagnated as an exporter during the past 14 years, due to misconceived policies adopted by governments in that time. Following the election of president Mauricio Macri, who is friendly to farmers, this is beginning to change, and grains from Argentina will be much more competitive from now on. Last year just over 100mt (million tonnes) of soya products and maize were exported from Brazil, compared with the 40mt of grains exported a decade earlier. So it is not surprising that logistics has not kept up. Amazon region, or from the north eastern port of Itaqui. Up to 50% of all grains will leave from the north by the mid 2020s, as all extra plantings will be concentrated in the north. Another long-planned project, still not complete, is the 1,500km Cuiaba–Santarem highway, the BR 163, which is even more crucial to the soya industry than the North–South rail line. Like the North–South line, paving BR 163, which runs through regions subject to torrential rains during the summer months, was first begun 40 years ago. But despite endless government promises, the route has still not been competely paved with asphalt of sufficient thickness to withstand the weight of modern trucks — let alone duplicated, which is now essential to cope with the massive volumes now using this route. The extra pressure is because trading companies, including Bunge, Cargill and Dreyfus, as well as the nationally owned Amaggi and Caramaru companies, have begun to recognize the great potential of the Tapajos river. This is navigable to large barge trains all the year round between the small town of Itaituba, upstream from the deep water port of Santarem, and also from the Vila do Conde complex, close to Belem and the open sea. Cargill has long operated a terminal at Santarem which handles much of the grain carried down the large Madeira river, a system also used by Amaggi. Much of the grains grown in Rondonia state use this route.. Using these waterways allows grains to reach deep water ports for up to $60 less per tonne than if they were taken by truck to the ports of the south, which the majority still is. The new routes are also two or three days less sailing time from destinations in Asia and Europe than those from the south, even more than that from ports in Argentina, further cutting costs. The advantage of shipping from the north, which will increase when the expansion of the Panama canal is complete, allowed some Brazilian-grown maize to be shipped to the United States last year. This maize cost $6 per tonne less in the south of the US than the maize grown on plantations in the US Mid West. 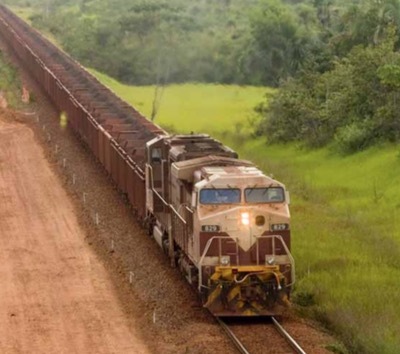 Frustrated with the delays in paving the BR 163, the largest soya exporters are now seeking to raise finance for the construction of the ‘Ferrograo’ railway, a 1,100km line which will terminate at Itaituba, which is alongside the BR 163 road. Finance from China is being sought for this costly new route, which may have to compete with a new railway of equal length to run directly from the point where the North–South railway joins Vale’s Carajas line, and Vila do Conde. This is an example of a situation where two costly alternatives may be started almost simultaneously. Following the controversial impeachment of the Brazilian president, Dilma Rousseff, and the consequent ending of the 14 years during which the left leaning Workers Party ruled Brazil, the country’s new minister of agriculture who took over in May, was Blairo Maggi, previously chief executive of the Amaggi company. Maggi is Brazil’s largest soya farmer and is a leading light in pressing for the development of the Amazon region, where soya is beginning to be planted. This is a controversial development, which is worrying environmentalists. There is a slight chance that the highest courts will decide that the vote by the two houses of congress to impeach Dilma was not legal and she will be re-instated. But given the fact that the policies of her administration coincided with two years when the Brazilian economy shrank by close to 6%, that 11% of the workforce is now unemployed and that wages have been falling, there is not much appetite for her return. Even though society is deeply divided over the issue. Although the PT’s policies of re-distribution, which involved large increases in the minimum wage and pensions, worked well for a time, they helped cause the present deep financial crisis. Many the PT’s policies have run their course. During the 14 years in which the PT was in power, corruption, which has always been rife in Brazil, got much worse. Much of it involved the state owned oil company Petrobras, which set about a huge and costly expansion programme in the effort to bring ashore the large reserves of crude oil found beneath deep waters offshore. As well as building roads, railways and ports, Brazil’s large construction companies became deeply involved in the oil projects, which allowed several billion dollars to be siphoned off. The chief executives of some of the companies involved have ended up behind bars, which has paralysed the industry. plans big investments. The new company controls a third of Brazil’s total railway network of about 30,000km of track. New stretches of track are to be built, existing ones upgraded to allow the share of goods reaching Paranagua by train to rise 50%. Rumo is owned by the Cosan group, the leading producer and exporter of sugar and a partner with Shell in oil and ethanol distribution in Brazil. Brazil’s new foreign minister, Jose Serra, is anxious for a project which will permit many more goods to travel by water between five countries in the region, Brazil, Argentina, Bolivia, Uruguay and Paraguay. At the moment, only 1% of the goods moved between Brazil and Argentina, the market for 40% of Brazil’s exports, travel by inland waterway. Improvements would require linking the 1,300km-long Tiete-Parana system, which traverses Sao Paulo, Parana and Goias states, with the Parana river and its tributary the Paraguay. The Paraguay river traverses Paraguay and passes close to Bolivia, finally reaching soya producing regions in Mato Grosso state. Such a waterway would require giant locks to be built at the Itaipu power station, one of the world’s largest. Further north, the Vale company has joined forces with Japanese trading company Mitsui and others, to form the ‘Integrated Logistics’ company. As well as the lines used to carry 300mt of iron ore each year from Vale’s Carajas mines in Para state and its mines in Minas Gerais state, to the ports of Itaqui and Tubarao the Integrated Logistics company operates a tortuous line which links the state of Bahia, with Minas Gerais and the south, a link which is to be upgraded. One line on which little progress is being made since work started in 2006, and which was scheduled to open to traffic by 2010, is the Transnordestina. This is to run east from soya producing areas to ports in Pernambuco state. The Transnordestina is making very slow progress, and is having difficulties obtaining finance, and with being granted wayleaves. The Transnordestina is not progressing as slowly as a parallel line planned to cross Bahia, one of Brazil’s largest states, from east to west. It had been hoped that this line would allow large reserves of iron ore in Bahia state to be developed by newcomers to the ore industry. But this option now appears much less attractive than a decade ago. The steel industry in Chin can be expected to follow the example of those in the United States and Europe and gradually switch from using iron ore, to using scrap steel instead, as much more scrap becomes available there. This means prospects for the ore industry as a whole do not look as bright as a decade ago. Another project on the drawing board for decades, is building a 60km line aimed to allow trains destined for Santos to by-pass the huge city of Sao Paulo, Brazil’s largest, rather than passing right through the centre of the city in the dead of night, as many now do. This line is vital if a higher proportion of the 100mt of goods embarked each from Santos, including large volume of soya, maize, sugar and market pulp, are to reach there by train. But this project too has fallen foul of the difficulties affecting the construction companies contracted to build it. Several have been found to have siphoned off large proportion of the funds allocated for building a ring road around the city. All in all, rarely has so little been spent by the government on infrastructure projects as now. Private companies claim that they must now devote 12% of all their spending on logistics, rather than the previous 10%. This at a time when the demand for most types of goods, as well as the prices which can be charged for them have fallen. Inland navigation, water economy, market potential, the state of port infrastructure adapted to handle inland navigation, and chances of increasing the competitiveness of the Polish economy through the integration of international waterways into international transport corridors were just several of the topics discussed in mid-June in Warsaw during the Waterways International Exhibition and Conference. Just like two years ago, the event attracted a number of representatives of government and regional authorities, as well as companies for which inland navigation is a mode of transport with a high potential for growth, providing prospects for increasing the competitiveness of the Polish economy. It is no different for the Port of Gdansk — a partner of the Waterways conference, for which inland navigation and activation of the Wisla River for water transport is an important issue. Today, goods transported into and out of the port mean several thousand of lorries and freight train cars a year encountering modernized infrastructure — which, however, has its limitations. Taking into consideration the predicted further intensive growth in the annual volume of goods passing through the port’s quays, predicted in the port’s strategy, which may reach a level of up to 100 million tonnes by 2030, the need to activate inland transport may become inevitable within the next dozen or so years. Such changes in the structure of participation of individual modes of transport in the handling of goods are also mentioned in the White Paper, which states that by 2030, 30% of road transport of goods at distances longer than 300km should be transferred to different means of transport, e.g. rail or water transport, and that by 2050, this level should increase to 50% of that type of transport. As Ryszard Mazur, Head of the Strategy and Development Department of the Port of Gdansk Authority SA emphasized on the second day of the conference during a discussion panel dedicated to ports and the potential of inland navigation, among others, the Port of Gdansk is now truly ready to handle goods transported via inland navigation. It has the appropriate quay infrastructure, and considering its location right at the mouth of the largest Polish river, deliberately avoiding the use of such a convenient location would be unreasonable. The current share of inland navigation in Gdansk is minimal, and this shows that the potential for development for this mode of transport is huge. Inland navigation also presents a chance to activate the role of Poland as a transit country for cargo travelling to/from its neighbouring countries, including Belarus, Ukraine or Gdansk’s southern neighbours, which constitutes a part of the proposals included in the Port of Gdansk’s development strategy. The three-day conference and its accompanying exhibition attracted a considerable group of entrepreneurs to the port’s stand, including both domestic and foreign visitors interested in the opportunities of handling cargo in Gdansk as part of inland navigation, which also serves as proof of the sector’s strong interest in this mode of transport. The Port of Gdansk’s stand was also visited by eminent guests, such as Marek Grobarczyk, the event’s Honorary Patron, Minister of Maritime Economy and Inland Navigation, Jerzy Materna, Secretary of State in the Ministry of Maritime Economy and Inland Navigation and Dorota Arciszewska-Mielewczyk, Chairperson of the Sejm’s Maritime Economy and Inland Navigation Committee. Moreover, the Waterways conference showed that the activation of Polish rivers is not just a transport-related issue — it also concerns the issues of the country’s flood safety, the possibilities for development of our native manufacturing technologies for the reconstruction and modernization of the inland fleet, and the activation of inland water tourism. The three-day debates as part of the 2016 Waterways event were concluded on Saturday, 18 June. Another edition is coming next year, and the Port of Gdansk will certainly be there, too. Wilhelmsen Ships Service (WSS) is moving to ensure that its customers’ vessels pass through the new Panama and Suez Canals with the optimum efficiency, speed and safety thanks to a fresh Ships Agency ‘canal transit’ solution. The service, which will be run by dedicated local teams, has already picked up its first contract, securing an agreement with leading very large gas carrier (VLGC) owner and operator Avance Gas for the Panama Canal transit of its neo-Panamax ships Passat and Breeze. WSS, the leading global provider of products and services to the shipping industry, has created 24/7 Transit Desks in both Panama and Egypt. These combine local knowledge with global support and service standards, arranging all permits, payments, rebates (where applicable), handling PDA/RDA/FDA needs, giving regulatory advice, and delivering further support services, including husbandry. In addition,WSS can supply vessels with their extensive range of marine products and chemicals during transits. The concept, according to Steffen Langlete, Product Manager, Ships Agency WSS, is a simple one. “We’re answering market demand with a service that will help our customers maximize the potential of these exciting new shipping infrastructure projects,” he explains. “Both of these expansion programmes have the potential to deliver huge time, capacity and cost efficiencies for shipowners and operators, but only if their transits are problem free. The first ships to take advantage of the offer are the two 83,000 CMB VLGCs from Avance Gas. Passat and Breeze passed through the new canal — which should double the capacity of the existing waterway, with two new sets of locks and deeper, wider shipping channels — in the last week of June. The canal itself opened on 26 June as the neo-Panamax vessel COSCO Shipping Panama made its inaugural passage. Speaking about the on-going agreement with Avance, which will see a number of additional vessels from their 14-strong VLGC fleet transit the canal with assistance from WSS, Langlete adds: “WSS Agency has a strong relationship with Avance, which appreciates our global network and standardized high quality services for its diverse international fleet. The Panama Canal Expansion Programme is the largest development project to take place on the waterway since its opening in 1914. Egypt’s new Suez Canal expansion opened in August 2015, cutting vessel waiting time from 11 hours to three hours and potentially doubling the number of daily transits. The WSS Transit Desks are now open to provide support and advice to the global market 24/7 365 days a year. Both have attained ISO 9001 Quality Management certification.